Coconut oil may pose a serious health risk for people on a low-fat, plant-based diet. Yes, that means most of our tribe. If you’re a vegetarian that fits the description above, adding coconut oil can increase inflammation and decrease blood vessel flow, which can cause serious damage. There are zero omega-3 fats, the essential fats people actually need. I know this goes against everything you may have heard about coconut oil, and therefore not an easy pill to swallow. It’s so popular, they even sell coconut oil for dogs. Many of the health and fitness websites I trust have advocated its use. This goes to show how difficult it can be to know the difference between hype powered by industry (money), experts regurgitating what the last expert said, and actual good advice. This reminds me to stay on my toes about what I advocate and write about. Are there any benefits to coconut oil? 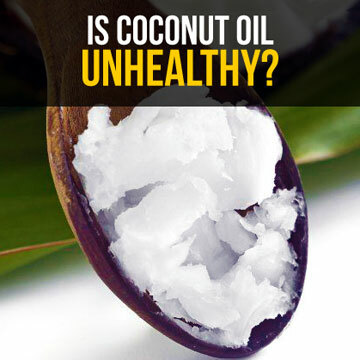 “Well, it is true that coconut oil contains some medium-chain fatty acids called MCFAs, which are less readily absorbed compared to longer-chain fatty acids. And these MCFAs have been shown to have less of an effect on LDL, bad cholesterol. But is that not similar to saying that burning your hand with a 300-degree flame has less of an effect on your skin than burning your hand with a 400-degree flame? Oil and fat are oil and fat. Also, we don’t eat foods because of their antimicrobial properties; therefore, consuming coconut oil for that reason is rather silly. Food doesn’t fight infection. Our immune system does. We eat foods for fuel and nutrients, which has the tendency to strengthen our immune system. This in turn fights microbes. With that argument, we could recommend pounding Absolut Vodka as a health food because alcohol kills microbes. What is coconut oil good for? Consuming coconut oil the way that’s its marketed is very likely to be unhealthy, and at best, it’s nutty advice, says the University of Berkeley. And it seems most vegetarians have even greater risk to face. I’m still going to cook with it, but the days of taking a teaspoon of it with my protein drink for fat-burning results are over.